Sometimes there are things we take for granted that we know about a place like Los Angeles, and what we thought we knew was wrong, like some of the Top 10 Myths and Misconceptions about LA and More Myths About LA. Other times things are just plain confusing, and you get a different answer from 10 experts on the same subject. To clear up some confusion, and in some cases to highlight were confusion exists, I've put together this Los Angeles Trivia Quiz. Each question is followed by the answer and its explanation. See how many facts you know about Los Angeles. What is the original name of the City of Los Angeles? And the answer is...it depends whom you ask. There are various plaques around town and historic documents using each of these names to describe what is now known simply as Los Angeles. Two friends, Doyce P. Nunis, former editor of the Southern California Quarterly, and Msgr. Francis J. Weber, archivist for the Catholic Diocese of Los Angeles, who are each experts in the city's history, disagree on which was the official first proper name. Weber claims that the city was named after the Los Angeles River. The river was named by Franciscan priests who happened to stop by the river in 1769 just before the feast day of St. Mary of the Angels of the Porciúncula, who graced a chapel in Assisi, Italy, where St. Francis of Assisi preached. Juan Crespi, the scribe for the missionary expedition led by Gaspar de Portola, wrote in his journal that the river was designated "in honor of Nuestra Senora de los Angeles de la Porciúncula." So according to Weber, the proper original name for the city, named after the river, was "El Pueblo de la Señora de Los Angeles de la Porciúncula." He suggests that La Reina was added or substituted later by mistake. As an aside, Porciúncula just means "small portion" in Italian, and was a reference to the small piece of land where the original chapel was built in Italy. Nunis, who published the book, The Founding Documents of Los Angeles, Bilingual Edition, claims that the true name of the city can be traced to a map from 1785. Across the top of that map is "El Pueblo de la Reyna de Los Angeles," or "The Town of the Queen of the Angels." Crespi said they named the river. There was no town. Claiming the town has the exact same name as the river based on a description of the naming of the river is a bit of a leap, especially when the town was founded later by different people. The guy (I assume it was a guy) who created the 1785 map, couldn't spell, so might have gotten some other things wrong too, so I wouldn't call that definitive. He probably didn't have enough room to write something as long as "El Pueblo de La Senora de Los Angeles de Porciúncula" anyway, so it might have been shortened just for expediency. According to an exhibit at LA Plaza museum at El Pueblo de Los Angeles Historic Monument, in 1871, forty-four people from what we now call Mexico settled a pueblo (town) named by Governor Felipe de Neve "La Reina de Los Angeles." This would agree more or less with Nunis, without the spelling variation and not including the descriptor "el pueblo" as part of the name. But I didn't see an actual piece of paper (or photo of one) in the exhibit decreeing it so. Others claim de Neve named the city "El Pueblo de Nuestra Señora la Reina de los Angeles del Río de Porciúncula," which really doesn't make any sense at all, since the river wasn't named after a small patch of land, it was named after St. Mary of the Angeles. It's possible that the Spaniards didn't know what Porciúncula meant and used it as shorthand for the name of the river, but that's all speculation, not fact. So as you can see, we really aren't sure what the original proper name for the city was and your guess is as good as anyone else's on this one. I imagine they argued about it just as much back then, which is probably why there's no definitive document. So let's just call it Los Angeles and leave it at that. What Does LAX Refer to? 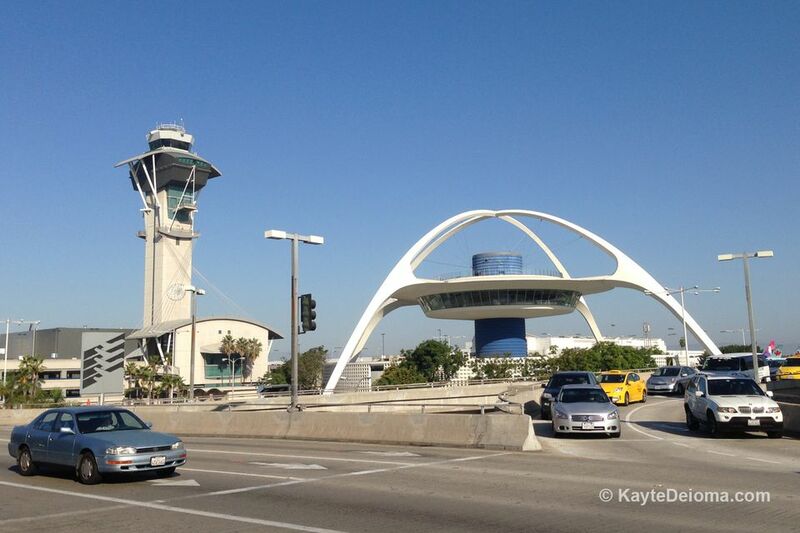 While most commonly recognized as the call letters for the Los Angeles International Airport, LAX is also the official designation for both the Port of Los Angeles in shipping, and LA's Union Station in railroad transportation, so whether you arrive by ship, train or plane, your destination will be LAX. LA Trivia Question 3 - What is the Land Area of the City of Los Angeles? What is the Land Area of the City of Los Angeles? The City of Los Angeles covers approximately 500 square miles of which 469 square miles is land - compared to, for example, New York, with twice as many people on 300 square miles of land. Los Angeles is not the largest urban city in the US based on land mass. That honor goes to Jacksonville Florida, at over 800 square miles, and there are dozens of rural and remote cities that cover more miles of land, the largest being Yakutat, Alaska, with a land area of 7,650.46 square miles, including glaciers and ice fields. The Los Angeles map has holes in it where other smaller cities are completely surrounded by its mass. At it's tallest point, it's 44 miles north to south. At it's widest point, it is 29 miles west to east. There is a 10-mile strip of the city connecting South LA to the LA Harbor communities of Wilmington and San Pedro that is less than a mile wide. With it's zig-zagging border, the city's perimeter stretches 342 miles. How Many Major US Cities Can Fit in LA? Los Angeles is the only major city in the United Status bisected by what? While the LA River does cut through the city from north to south, and it's been re-routed and lined with concrete for a good stretch, it was originally a natural river. We also have long avenues lined with palm trees, although there's not one that is lined with palms for the entire length of the city. We are unique though in being the only US city cut right through the middle by a mountain range that separates the LA Basin, which includes Downtown LA, East LA, Hollywood and the West Side, and extends down through South LA to the Port of Los Angeles, from the San Fernando Valley, which contains an equally large section of the City of Los Angeles broken into 29 individual named communities, each larger than many cities. The mountain range that divides the city and creates wonderful outdoor recreation opportunities for residents and visitors, is the Santa Monica Mountain Range, which stretches from the Pacific Ocean at Malibu east to Griffith Park and Elysian Park north of Downtown LA, ending at the LA River (and the Interstate 5 Freeway). East of the Los Angeles River, on the other side of Glendale, the San Gabriel Mountains separate the LA Basin from the Mohave Desert. Which of these is NOT an incorporated city surrounded by the City of Los Angeles? Which of these is NOT an independent city surrounded by the City of Los Angeles? Of Hollywood, West Hollywood, Beverly Hills, San Fernando and Santa Monica, Hollywood is the only one of these that is NOT a city in and of itself. It is a neighborhood of the City of Los Angeles. West Hollywood and Beverly Hills are independent cities, that, except for a couple blocks where they border each other, are completely surrounded by Los Angeles. San Fernando is a tiny city in the far north of the San Fernando Valley, which is also bordered on all sides by LA. Santa Monica is wrapped around by Los Angeles on three sides, with the Pacific Ocean on the fourth side to the west. The hot winds that blow during a Los Angeles autumn, are named for which Southern California canyon? The hot winds that blow during autumn in LA are named for which canyon? The hot, dry winds that blow through Los Angeles in the fall, and sometimes at other times of the year, are knows as the Santa Ana winds, supposedly after Santa Ana Canyon through the Santa Ana mountain range that runs between Orange County and Riverside County along the southeast side of the LA Basin. The Santa Anas are downslope winds originating in the desert and blowing all the smog, pollen, spores and fungus across the LA Basin to the ocean. They are known for causing flu-like symptoms and exacerbating allergies, as well as making people irritable. They also increase the wildfire danger in the area significantly. If the weather forecast is predicting Santa Ana winds, it's a good idea to plan indoor, air conditioned activities, like visiting one of LA's many museums. Which one of these industries employs the most people in LA? Although many people think that the entertainment industry is the biggest employer in LA, of these four, health care (487,000) and retail (378,000) have recently moved ahead of manufacturing (which dropped from 453,000 jobs in 2008 to 357,000 in 2011), as the largest industry sectors by number of employees. The entertainment industry, while still significant, is in last place of these four, with around 87,000 employees and around 100,000 independent contractors. The government sector tops them all, with over 586,000 people in city, county, state and federal government jobs based in LA. Which California Mission was the base for establishing Los Angeles? The Mission San Gabriel Archangel, in what is now the City of San Gabriel, northeast of Downtown LA, was the Catholic Mission established by Junipero Serra in 1771 as part of the chain of missions designed to solidify Spanish ownership of California. The original site of the Mission was near Montebello, but it was moved to its current site in 1775, with the existing mission building finished in 1881. The San Gabriel Mission was the base for Christianizing the native Tongva people, who were called Gabrieleño, as disciples of the mission, differentiating them from the Juaneño/Acjachemen people to the south who were under the influence of the San Juan Capistrano Mission or the Fernandeño Tataviam Band of Mission Indians surrounding the San Fernando Mission to the north. It was a party of 44 settlers from Mission San Gabriel, mostly of Indian and African mixed descent, with a couple Spaniards, who founded El Pueblo de la Reina de Los Angeles (see answer 1 for the name debate) in 1781. If you explore El Pueblo de Los Angeles State Historic Monument, also known as Olvera Street, you might come across a small church with a sign over the entrance that says "Mission Nuestra Señora Reina de Los Angeles, founded September 4, 1781." Records show that a in 1784 as a sub-station to Mission San Gabriel was built here to serve the new town. The current church, Church of Our Lady of the Angels was built here in 1814. LA Reina or "Queen of" was added later. The church is often referred to as La Placita Church or the Old Plaza Church. Read more about the San Gabriel Mission and Museum.